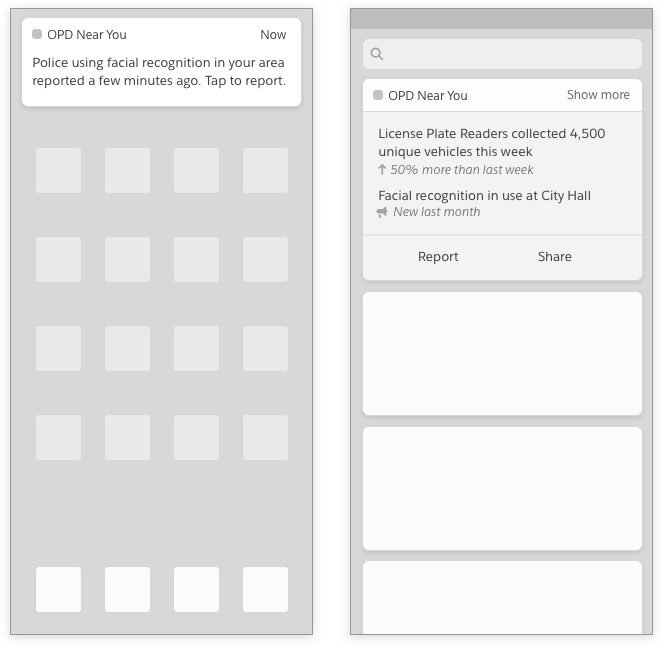 Through push-based notifications, widgets, and a native app, anyone in a community can learn about privacy-diminishing technologies in use in their area. When cities acquire technologies that could impact citizen’s privacy, the forums to notify individuals about repercussions or consequences are difficult to learn about and raise concerns about. Some cities have privacy advisory commissions, but learning about ways to participate, or even to learn about their existence at all is difficult. An app that informs users about privacy-diminishing technologies being used in their area by partnering with local governments and through crowd-sourced data. Users can report concerns and share information with their network. Tech-savvy users that want rich information of local privacy diminishing activities. Jennifer is an engaged community member and stays up-to-date with the news. She’s read about the prevalence of new technologies in use by local police departments, and while understanding the potential good for this, she's concerned about the risks of abuse it creates.